January 29, 1921. Washington, D.C. "Herbert Bell and Joe Garso." The one-legged trick bike riders put on a show. National Photo glass negative. View full size. Submitted by stanton_square on Sun, 06/28/2009 - 1:53pm. The Railway Express truck appears to be a Walker Electric. It looks similar to this stuck truck as well as Carry's Ice Cream Truck. There is no nose to speak of, large boxes (battery cases?) between the wheels and virtually identical wheels and hubs. Submitted by RDown3657 on Sun, 06/28/2009 - 12:17pm. The Railway Express guy is not amused. Submitted by Tipster on Sun, 06/28/2009 - 7:43am. Interesting shot. Love the expressions of the folks in the back-interested and bemused, but not entirely comfortable with what they are seeing. I also like all the different modes of transportation seen or hinted at in this shot. Is that a homemade Razor Scooter that the kid is holding on the far right? Right by it on the curb looks like a crutch and something looking a lot like a single roller skate. Those non-pneumatic metal truck wheels cast to look like they have wooden spokes are an interesting sign of transition: technology was moving ahead of old ideas about what wheels should look like. Could those people be waiting for a bus? What's that sign behind the paper boy? 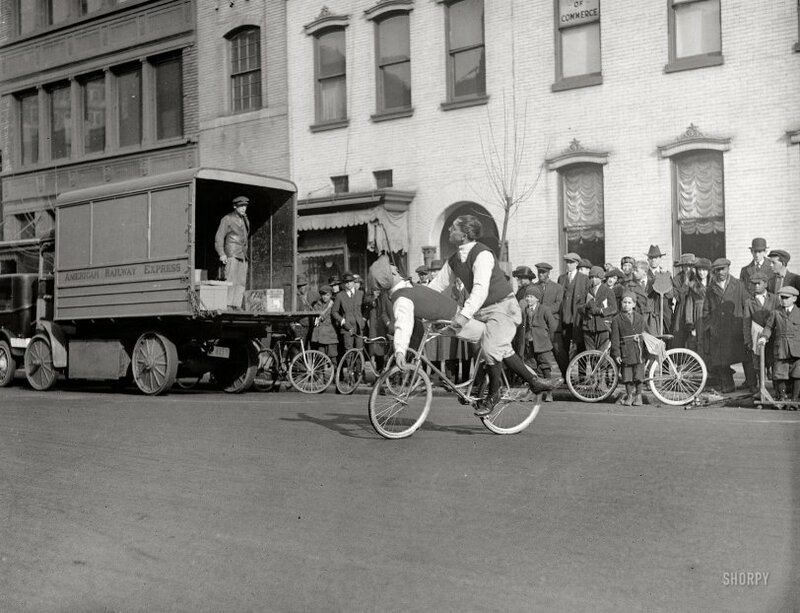 And it always strikes me to see how relatively little bicycles have changed. Incidentally, any photo historians know if this was this pretty high speed film for 1921? With all the ghosts in the pictures on Shorpy from just a few years before, I guess we're seeing the fruits of sudden advancement in emulsion technology?